Master the Easy-to-Learn, Multifaceted Language Behind Google & YouTube with 50 Hours of Training! Over 10000 satisfied students have enrolled in this highly-rated Python courses across the Web. Why? This course will teach you essential Python concepts that are extremely relevant in any tech career, not to mention perfect for building amazing network tools. Follow along with the below hands-on projects, and you'll solidify the concepts and skills to confidently code with Python. 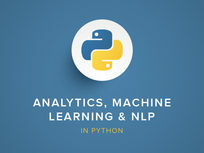 Python is not only one of Google's preferred languages, but an extremely in-demand skill sought out by companies everywhere. That's why there's no better time to take this course, and benefit from over 60 years of software development and teaching experience. Start with absolute beginner concepts like understanding the tools you need to download and install Python on your machine, and continue on to learn to write your very first Python program. You'll then progress into more advanced concepts that will leave you prepared to get coding completely on your own. Tim Buchalka is an Android app and games developer, and teacher with 30 years of development experience! He spent years as a contract software developer working for government departments, and large prestigious companies like Saab, Mitsubishi, and Fujitsu (to name just a few) in a developer/team lead developer capacity. He is skilled in many development languages including Java, C++, C#, and Objective-C, to name a few. For the past 10 years, he has been self employed, and now focuses exclusively on teaching others how to develop apps for an Android platform. For more details on this course and instructor, click here. This course is hosted by StackSkills, the premier eLearning destination for discovering top-shelf courses on everything from coding—to business—to fitness, and beyond! Over 30,000 students have taken this course as their first step to programming excellence--it's your turn. Learn to write Python programs like a pro, solve real-world problems, and automate repetitive and complex tasks with this detailed course. You'll be able to create Python scripts with ease, and turn tedious and repetitious tasks into efficient processes. You'll save time and simplify your life on Linux, Unix, or MAC systems. Jason Cannon started his career as a Unix and Linux System Engineer in 1999. Since that time he has utilized his Linux skills at companies such as Xerox, UPS, Hewlett-Packard, and Amazon.com. Additionally, he has acted as a technical consultant and independent contractor for small businesses and Fortune 500 companies. Jason has professional experience with CentOS, RedHat Enterprise Linux, SUSE Linux Enterprise Server, and Ubuntu. He has used several Linux distributions on personal projects including Debian, Slackware, CrunchBang, and others. In addition to Linux, Jason has experience supporting proprietary Unix operating systems including AIX, HP-UX, and Solaris. He enjoys teaching others how to use and exploit the power of the Linux operating system. He is also the author of the books "Linux for Beginners" and "Command Line Kung Fu." For more details on this course and instructor, click here. This course is hosted by StackSkills, the premier eLearning destination for discovering top-shelf courses on everything from coding—to business—to fitness, and beyond! This is not your average penetration testing course. While most courses introduce you to simple techniques based on unrealistic situations with completely unsecured systems, this course will teach you the real skills you need. The instructor strongly believes that ethical hackers shouldn't rely on other tools--they should be able to make their own. There's no shortage of use cases for Python: from simple user scripts to web servers to complex APIs. It has a simple, highly-readable syntax which makes it perfect for beginners. Whether you're a beginner or looking to refresh your Python skills, this course breaks basic concepts down into beginner-friendly, comprehendible lessons. You'll finish the training with three hands-on coding exercises so that you'll feel confident in your skills by completion. Learn to work w/ words & characters using a data type known as the "string"
The EDUmobile Academy was founded in 2008 as a bootstrapped initiative of Vishal Lamba, who has been actively involved in the technology space since 1989. They're very passionate about creating courses that have world class standards, and providing heroic support to their community of learners. Every course is created by USA-based, technologically-qualified mentors, all having an absolutely clear diction and command over spoken English. Over the years they've provided guidance and training to a developer community of over 80,000. For more details on this course and instructor, click here. This course is hosted by StackSkills, the premier eLearning destination for discovering top-shelf courses on everything from coding—to business—to fitness, and beyond! Loonycorn includes Janani Ravi, Vitthal Srinivasan, Swetha Kolalapudi, and Navdeep Singh. Between the four of them, they have studied at Stanford, IIM Ahmedabad, and the IITs, and have spent years (decades, actually) working in tech around the world. This dream team strongly believes they have hit upon a neat way of teaching complicated tech courses in a funny, practical, engaging way! For more details on this course and instructor, click here. This course is hosted by StackSkills, the premier eLearning destination for discovering top-shelf courses on everything from coding—to business—to fitness, and beyond! Machine Learning: Why should you jump on the bandwagon? Sentiment Analysis - What's all the fuss about?